Nuclear weapons are undoubtedly among the most devastating devices ever built by man. For half of the 20th century, much of the world lived fearing the day when mushroom clouds would fill their sky, leading to the ruination of everything they’ve known, loved, and worked towards. (There was dramatic music playing in the background as I wrote that sentence. It may have affected my word choice…) Why shouldn’t they have been afraid; a nuclear bomb’s devastating effects were established at the end of World War II. The bombing of Hiroshima, Japan on August 6, 1945 is easily the most (in)famous nuclear explosion in history. 80,000 people were instantly killed, with many more eventually lost to radiation poisoning. The bomb used, known as Little Boy, is estimated to have released energy equivalent to detonating 15 kilotons (15,000 tons) of TNT. This was enough to destroy five square miles of city. As powerful as it was, nature regularly produces events that make Little Boy look very little indeed. This list compares 10 such events that occurred right here on Earth with the Hiroshima bombing. Nuclear weapons have advanced considerably since Little Boy, of course, so the following events are also compared with Tsar Bomba, the most powerful nuclear device ever detonated. At 50 megatons (50 million tons) of TNT, it was capable of destroying wooden buildings hundreds of miles away. Also, please note that I intend absolutely no disrespect to the victims of Hiroshima. I got the idea for this list from seeing so many documentaries about various natural disasters express them in terms of Hiroshimas. I thought it’d be a neat gimmick, basically. On February 15, 2013, an approximately 20 meter (66 ft.) wide meteorite streaked into Earth’s atmosphere at a shallow angle travelling 19 kilometers (12 miles) per second. The object broke apart and exploded, brightening the skies above Chelyabinsk, Russia with a large fireball. Three impacts by pieces of the object were found in the area, one leaving a crater 6 m (20 ft.) wide. The 440 kiloton explosion created a shockwave capable of damaging buildings in Chelyabinsk, 87 km (54 mi) away. Many windows were blown out, a factory wall collapsed, and residents were cut by flying glass and debris. Heating soon became difficult due to the broken windows. 1,200 people suffered mostly minor injuries, with around 50 requiring hospitalization. 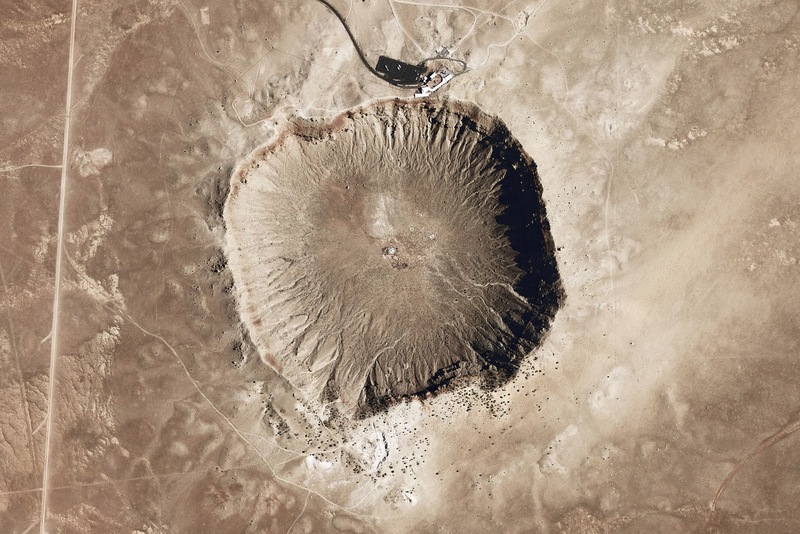 Barringer Crater, near Flagstaff, Arizona, is possibly the most well known impact crater in the world. Approximately 1.6 kilometers (1 mile) wide and 174 meters (570 ft) deep, the crater is an impressive sight, and very well preserved. It was formed 50,000 years ago when a 46 meter (150 ft.) object struck the surface of the earth at 42,000 kilometers per hour (26,000 mph). Miles of forest were leveled all around the newly formed crater, with a lake forming in it until the end of the last ice age, when the area became desert, aiding in the crater’s preservation. 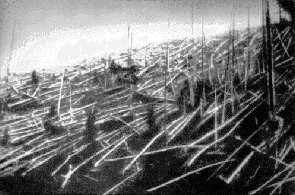 The famous Tunguska event occurred in the skies over Siberia on June 8, 1908. At 7:17 a.m. a massive airburst near the Podkamennaya Tunguska River shook the ground and leveled trees for miles in all directions. Reindeer herders 30 kilometers (19 miles) from the explosion were sent flying through the air. People 60 km (38 mi) away were knocked to the ground. The sound was described as deafening approximately 500 km (300 mi) away. The event was visible in the sky as far as 1,000 km (600 mi) away, and the following nights were oddly bright, such that it was possible to read a newspaper at midnight in Western Russia without any other light source. The general consensus in the scientific community is that the explosion was caused by a small comet which exploded roughly 8 km (5 mi) above the surface, releasing 12.5 megatons of energy. Who said the earth needed asteroids and comets to produce large explosions? Responsible for one of the most famous volcanic eruptions in recent history, Mt. St. Helens needs no introduction. Its May 18th, 1980 eruption tore most of its picturesque façade away, leaving a large crater. 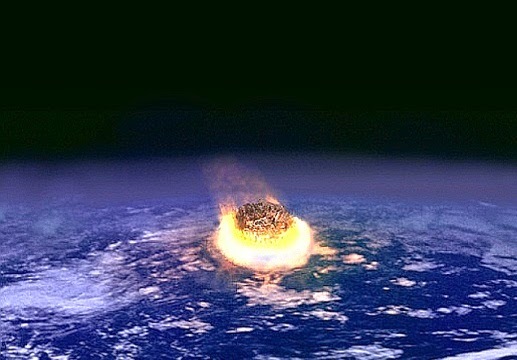 The event was preceded by two months of smaller eruptions and earthquakes. At 8:32 a.m. that morning, an earthquake measuring 5.1 on the Richter scale caused the already bulging northern slope of the mountain to fall away, creating the largest landslide in recorded history, and a cloud of volcanic ash that travelled 27 kilometers (17 miles) along the ground. An additional pillar of ash rose 24 km (15 mi) into the atmosphere. Winds carried enough of the ash eastward that the skies above Spokane, Washington, 400 km (250 mi) away, were turned as dark as night. The 1980 eruption of Mt. St. Helens released 24 megatons of energy total. If you remember some very cold winters in the early 1990s, you can thank Mt. Pinatubo. Located in the Philippines, Pinatubo had been dormant for over 500 years at the start of the 90s. 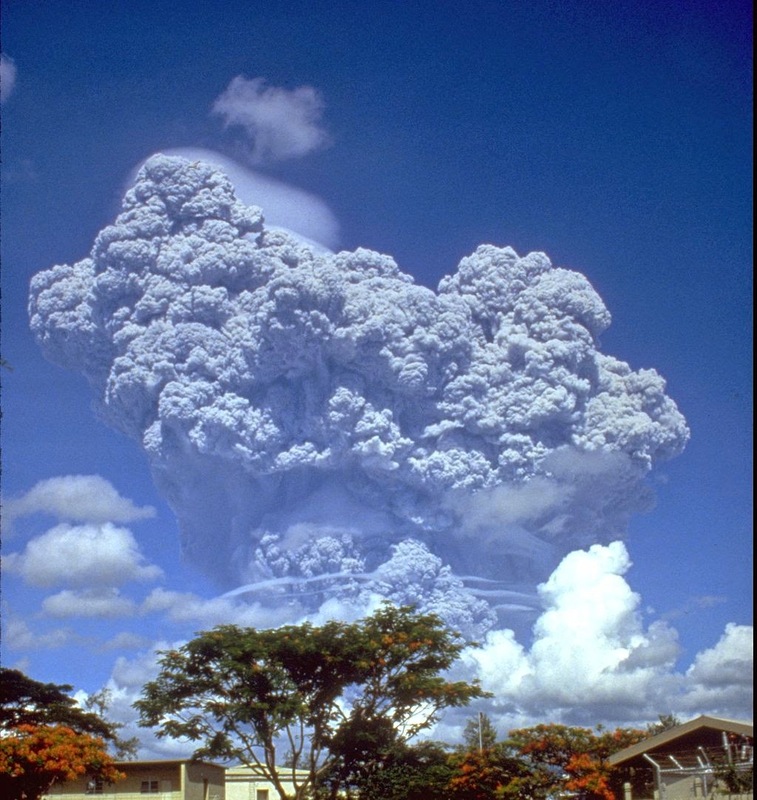 On June 12th, 1991, after a series of earthquakes and smaller eruptions over the preceding months, the mountain erupted, sending a massive ash cloud into the sky. This was followed by an even more cataclysmically powerful 70 megaton eruption on June 15th, which sent ash 35 kilometers (22 miles) into the atmosphere. So much material was ejected from Pinatubo that it collapsed into a 2.5 km (1.6 mi) wide caldera. 20,000 former residents of Mt. Pinatubo’s slopes were permanently displaced, and the ash buried many villages and farm fields as well as severely damaging two U.S. military bases. The ash also dammed several rivers, forming Lake Pinatubo, which permanently submerged more villages. In addition to the local damage, sulfur dioxide from the volcano proliferated throughout the stratosphere, lowering global temperatures for two years. Sometimes a volcanic mountain explodes, and sometimes an entire island explodes. Krakatau (often misnamed Krakatoa) is an island in the Sunda Strait between Sumatra and Java. Its 1883 eruption left barely one third of it above the surface. The area has since become so volcanically active that a new island, Anak Krakatau (meaning Child of Krakatau), formed from subsequent eruptions, now lies where part of the original island once stood. Before the famous eruption, the island had been dormant for a long period. This changed with an eruption on May 20th, 1883. By August, all three of the island’s cones were erupting regularly. On the morning of August 27th, four massive eruptions shook the island. The last of these, at 10:02 a.m. local time, tore the flanks of the island open, allowing seawater to pour into the magma chamber. The following steam explosion is believed to be the loudest sound in recorded history, audible as far as 4800 kilometers (3000 miles) away. It was this explosion which obliterated most of the original island. Volcanic ash rushed across the surface of the ocean, causing fatalities on neighboring islands, and even increasing the land mass of two. 40 meter (131 ft.) tsunamis also battered settlements along the Sunda Strait; ships as far away as South Africa felt the effects. Roughly 36,000 people were killed, mostly from tsunamis. Bodies floating on chunks of pumice were reported as far away as Africa for up to a year after the eruptions. Dust from Krakatau in the atmosphere produced extremely colorful sunsets for months, leading researchers to propose that Edward Munch’s painting The Scream is based on such sunsets. Krakatau’s final steam explosion released 200 megatons of energy. 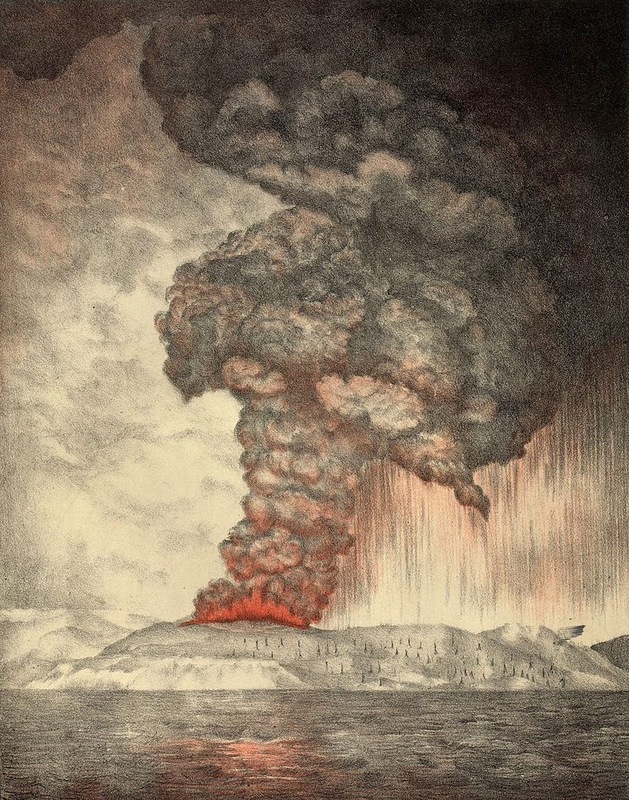 As devastating as the Krakatau eruption was, it wasn’t the largest volcanic eruption in recorded history. That title belongs to the 1815 eruption of Mt. 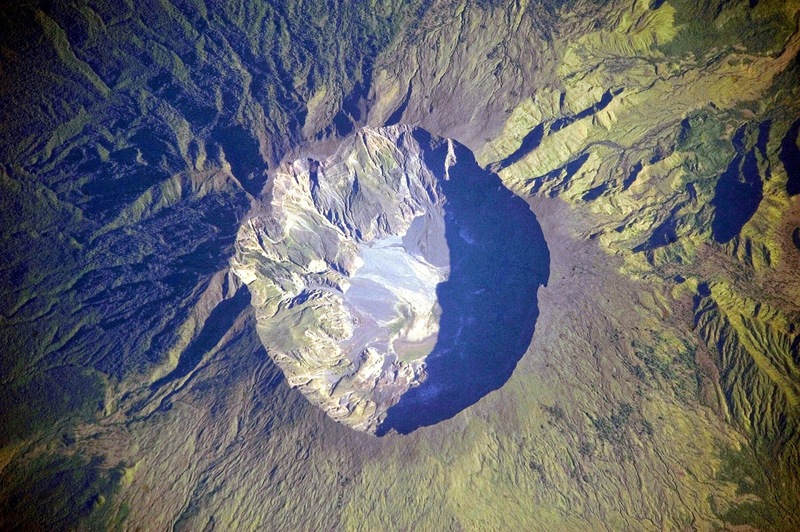 Tambora, on Sumbawa Island, Indonesia. On April 10th, an apocalyptic eruption, estimated at 800 megatons, destroyed a large portion of the originally 4,000 meter (13,000 ft.) mountain. 150 times more ash than Mt. 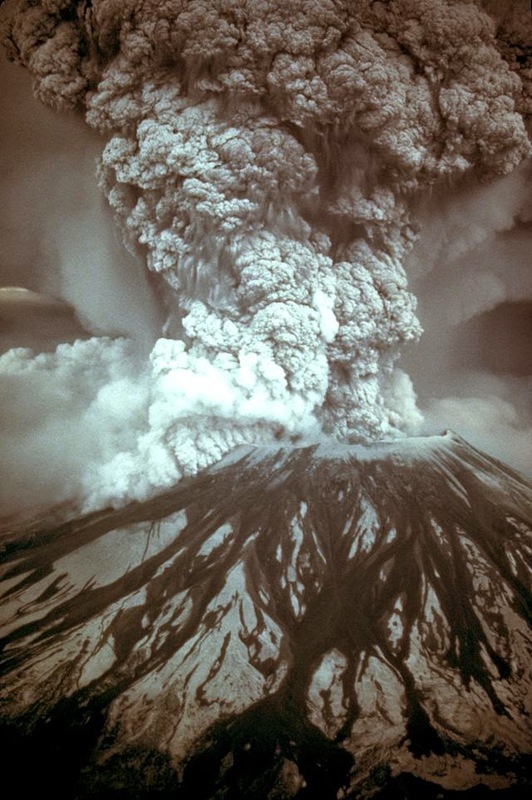 St. Helens was released, rising 44 km (27 mi) into the sky before falling as far as 1,300 km (800 mi) away. So much ash was sent into the atmosphere that 1816 came to be known as the “year without a summer.” Global temperatures were such that there was snow during June in New England. Roughly 92,000 people were killed by the eruption and famines brought by its effects. In 2004, the remains of a village on Tambora’s slope preserved in a manner similar to Pompeii were discovered, all that remains of the local civilization destroyed by the eruption. Lake Toba in Indonesia is in fact a volcanic crater marking the site of a supervolcano similar to the Yellowstone caldera. It is responsible for the largest volcanic eruption in the last two million years. Toba’s eruption approximately 74,000 years ago ejected 2,800 cubic kilometers (670 cubic miles) of material, leading to the formation of the current lake. Volcanic ash covered India, and fell as far west as the Arabian Sea. So much material was sent into the atmosphere that Toba is believed to have helped to push the earth into an ice age, though the world was already heading in such a direction before the eruption. 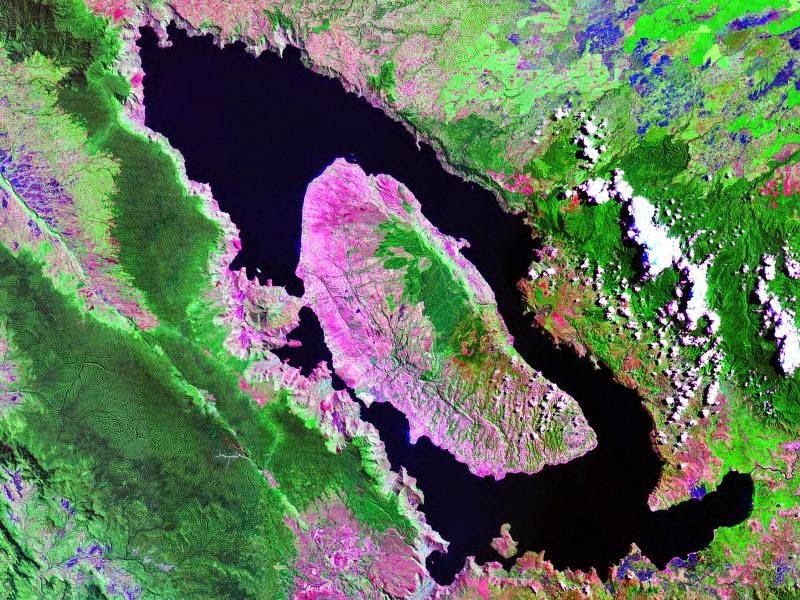 The Toba supervolcano has also been theorized to have nearly driven early humans to extinction, though there is disagreement on this, as its ash did not reach the Great Rift Valley, the area from which humans emerged. The eruption 74,000 years ago is estimated to have had 3,000 times more energy than the 1980 Mt. St. Helens eruption. Let’s call that 72,000 megatons. The K-T Impact can essentially be described as a mountain falling out of the sky. 65 million years ago, a 10 kilometer (6 mile) wide asteroid struck the Yucatan Peninsula, releasing 100 million megatons of energy. 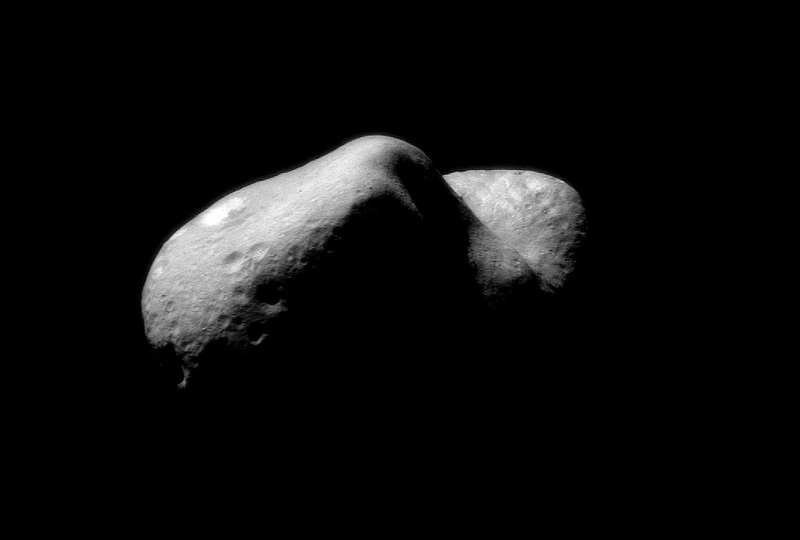 The trajectory and impact angle of the asteroid was such that the greatest amount of debris (and therefore the most damage) rained down on the North American continent. The most damaging effect for life, however was the dust thrown into the upper atmosphere, sufficient to block out sunlight for several weeks to months, causing massive disruptions to the food chain. Roughly 75% of species on Earth, most famously the dinosaurs, went extinct in this time period, and the K-T Impact is believed to have been a key contributor to this extinction.